For example, in some countries, girls are not offered an education . In fact, 66 million girls around the world are out of school! Have you ever been told that you couldn’t do something because you were “a girl”? Never forget that people said the very same thing to Amelia Earhart when she decided that she wanted to be a pilot. Sally Ride was told the same thing when she wanted to become the first female astronaut. They did not listen to the crowd. They followed their dreams and their hearts and they reached their goals. You can too. One other way that girls are often limited is how tv and the media often focus on beauty as a girl’s outward or physical appearance. But, true beauty doesn’t come from the outside. It comes from within. A beautiful person leaves love, kindness, generosity, and good deeds in their wake. That is what defines real beauty, not their hair or eyes or shoes. 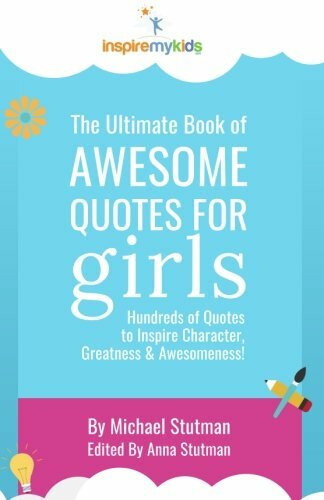 The section below features quotes from many inspiring women and girls who have had a great impact on the world. As they say, you need to have passion for something good, believe in yourself, be brave and just do it. Read these quotes, follow their advice, become the best version of yourself and go make a positive dent in the world! What are your special gifts, talents, likes and dislikes? How do you think you are you different than other people? Were you ever told that you couldn’t do something because you were a girl? How did that make you feel? What happened? What is one of your dreams? If you feel comfortable sharing, tell about it. What do you believe true beauty is? Is there someone in your life you believe is beautiful? Why? Have you ever changed yourself to try to impress others? Have you ever put someone down because they were different? How did this feel? Write down 5 of your biggest strengths and unique qualities. Keep this list by your bed and look at it every week to remind yourself what makes you you! Write down 3 ways that you can improve how you treat others who are different. Go out and do it! Today.